KlvInspector™ is a software application for deep analysis of STANAG 4609 or binary telemetry files / streams. It is an essential tool for UAV video applications development, integration and testing. KlvInspector provides in-depth insight into the KLV metadata - comprehensive and visual representation of the encoded KLV data, packet structure, binary/ASCII data preview and search functionality. It decodes a UAS Datalink Local Metadata Set (MISB 0601.X) metadata and allows an easy navigation inside the SMPTE 336M-2007 KLV packet, statistic report generation, metadata extraction (bin, csv, xml), KLV packets generation, optional conversion to CoT (Cursor on Target) and RS232 / LAN (UDP) recording/streaming. 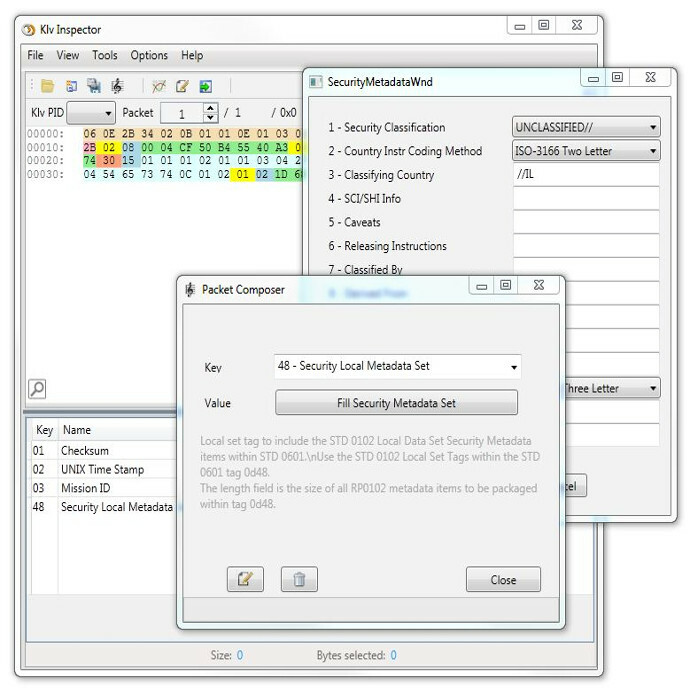 KlvInspector can be used as a source of KLV data, in case a real source for system testing is not available or classified. Visual representation of the KLV Packet structure. 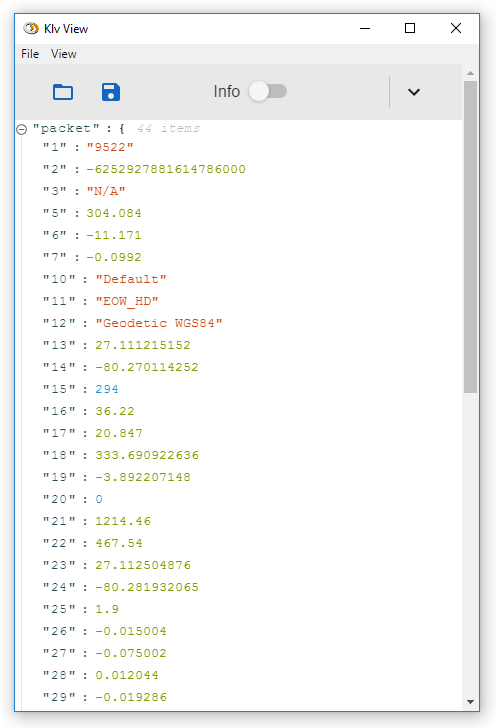 Packet Navigation (by packet number or time). Extraction of KLV metadata from STANAG 4609 files. MISB 0601, MISB 0102, MISB 0903. 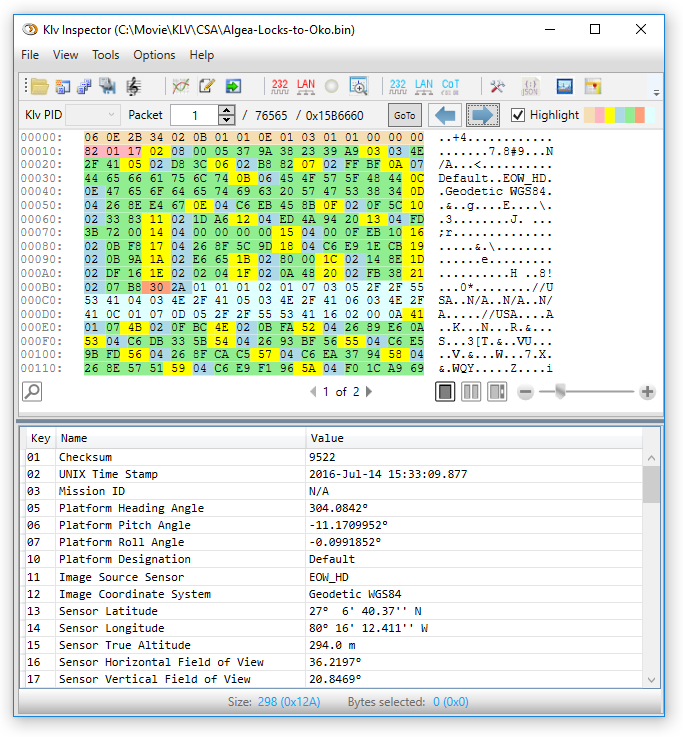 VMTI (Video Moving Target Indicator and Track Metadata) editor. Binary/ASCII data preview and search functionality. Json View. 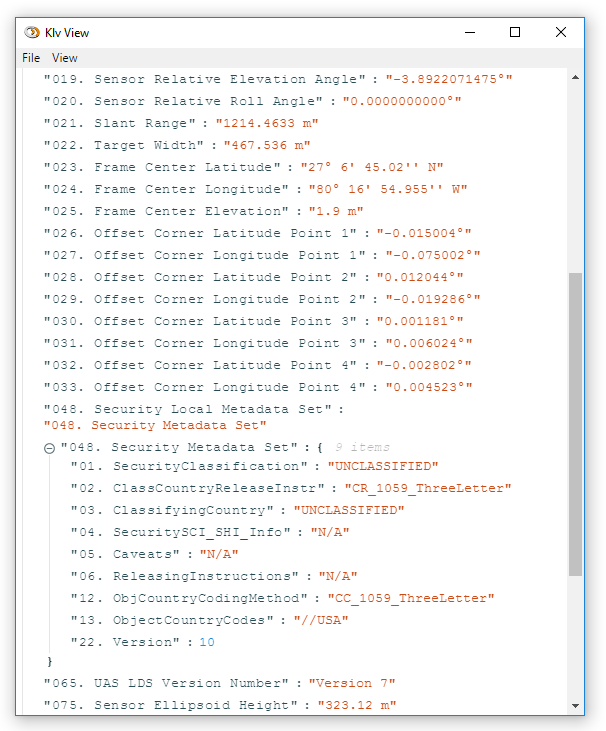 Klv to Json/GeoJson conversion. Load / Save to / from files. Load/Save Klv packets from/to binary files. 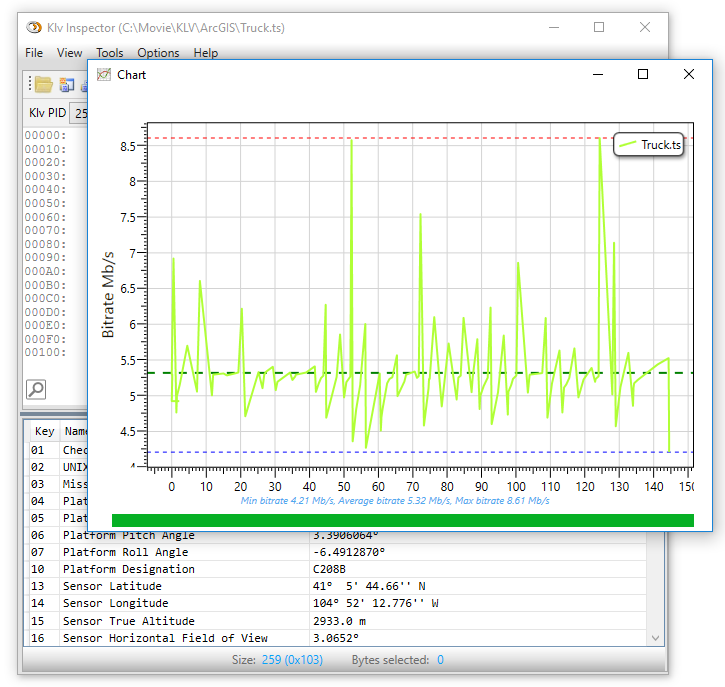 Record (with Live preview) binary telemetry (RAW Klv) streams (RS232/Ethernet). 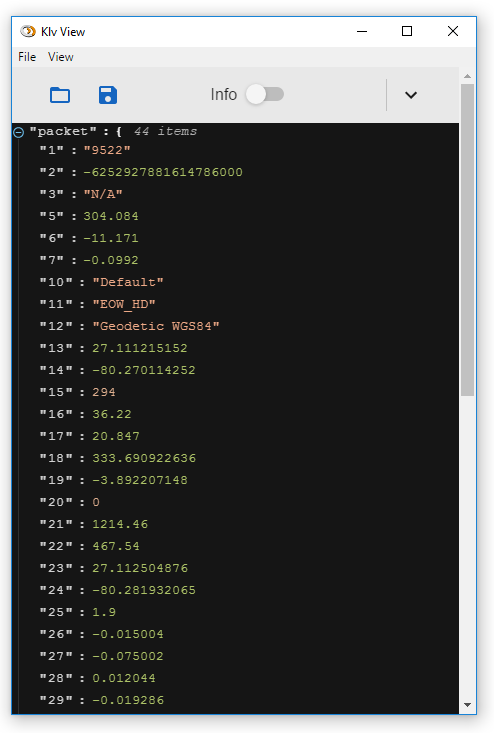 Metadata packet range export (by numbers, offset, KLV time) to binary, csv, xml or json files. Situational awareness - presentation on a map (online / offline). Bitrate chart plotting and PCR discontinuity monitoring. KLV Composer (Build KLV packet from scratch by adding individual items or edit existing packets). Send KLV packets over RS232 or Ethernet with configurable data rate. Convert KLV to CoT messages (MISB 0805) and send them over Ethernet.